Natural Ayurvedic Treatment for Cancer | ND Care Nirogam Pvt. Ltd.
Cancer is a dreadful disease which involves a lot of pain and agony. The main success of cancer treatment lies in its ability to penetrate the cell nucleus. I. Sanchaya: - It is an early stage that shows localized neoplastic changes due to an unhealthy accumulation of Dhatus. II. Prakopa: - It is the second stage that shows a transformation of primary growths into metastatic tumors. III. Prasara: - This is a metastasis stage in which the capability of spreading begins. IV. Sthana Sansraya: - This stage encompasses complete metastasis and secondary growth. V.	Vyakti: - In this stage, the clinical signs and symptoms are apparent and can be observed during a medical examination. VI. Bheda: - This is the final stage where differentiation of growth is understood on the basis of histopathology. The ancient medical system of Ayurveda (Asthang Sangraham) dictates that most diseases are caused due to Mithya Aahar and Vihaar (improper dietary and lifestyle). "If the concept is correct, the chances of recovery are high. followed while dealing with chronic diseases like cancer. Arbuda patients are treated with Apunarbhava Chikitsa. Additionally, we fortify the patient with quality formulations for promoting health and vitality." I. Administration of blood cleansing herbs along with the intake of a detoxifying diet. II. Circulation stimulant herbs to promote blood circulation that helps in shifting of stagnation of the blood, and increase the efficient expulsion of toxins to assist the healing of the tissues. III. Immunity restoring herbs to boost the vigor of patients. IV. Ayurvedic healing focuses on restoring the tranquility of the mind and body. So, counselling and Yoga are also recommended to support the aspect of personal healing. According to Ayurveda, health ailments emerge due to the disparity between mind, body, and spirit. The above protocols for cancer are helpful in bringing back the lost equilibrium and harmony of the body. According to Ayurveda, the natural cancer treatment involves Shamana Chikitsa, Shodhana Chikitsa (purification treatment) to eliminate the vitiated Doshas and Dhatus. Also, rejuvenating therapies (immunotherapy) in cancer & Shroto Shodhak Aushadh with Ashukari effects (fast acting), to scavenge on all kind of cancer cells. 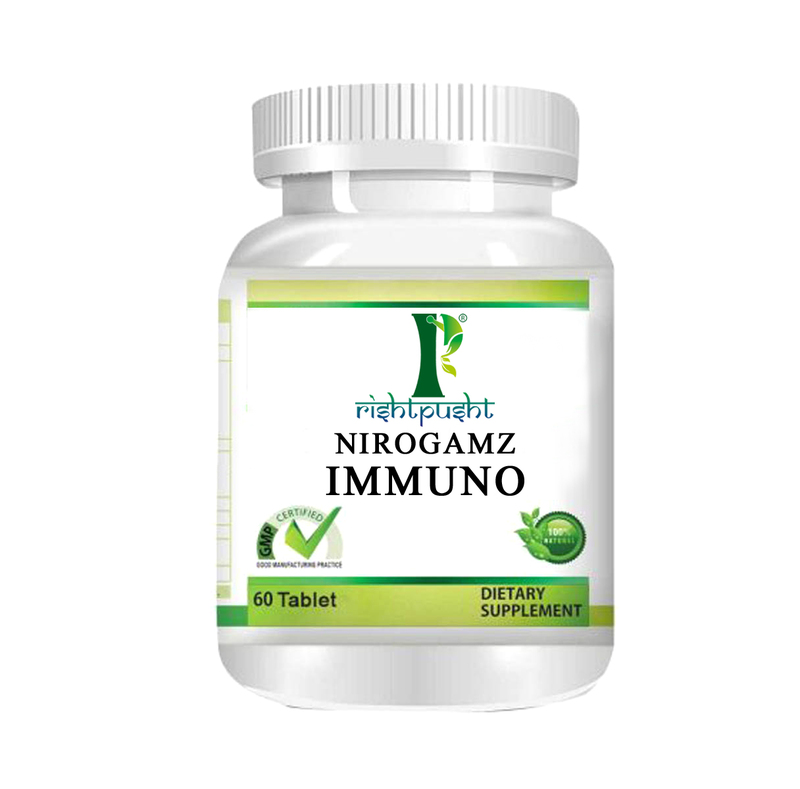 Nirogamz Immuno "Helps in building a strong immune system"
Sustains a strong immune system. Supports the body natural defence mechanism. 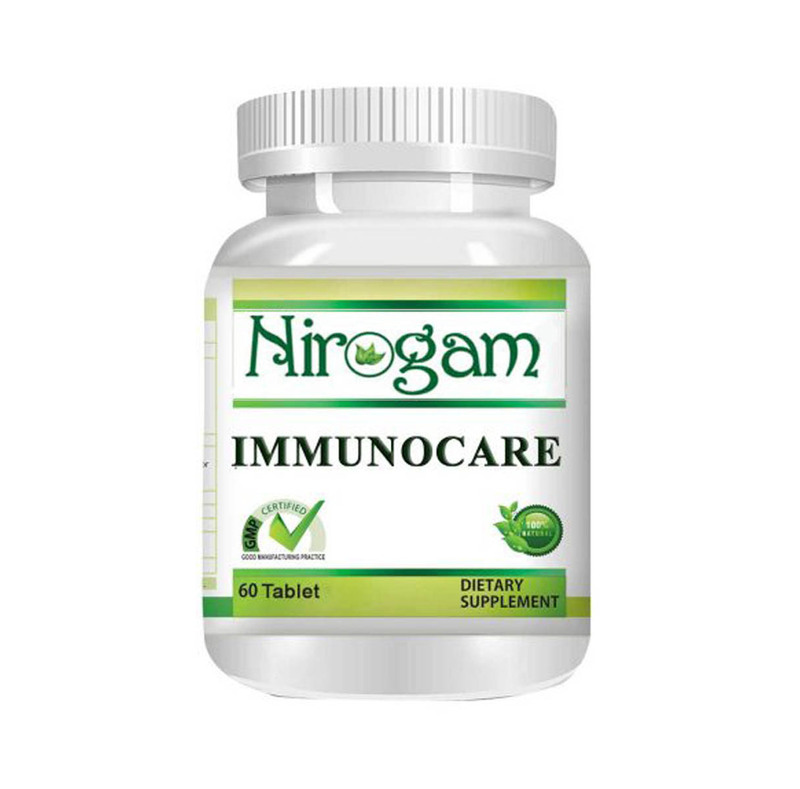 Nirogam Immuno Care "Supports normal immune function"
Acts as an immunity enhancer. Helps in fighting off invaders. Helps in fighting off autoimmune disorders. Amlaki: - It is commonly known as Indian gooseberry or Amla. It is used as an anti-oxidizing and anti-inflammatory agent. It has rich amounts of anti-oxidants. So, it helps to quench the free radicals in your blood and tissues. Ashwagandha: -It is a major Rasayana in Ayurveda. It is an immunomodulatory, anti-inflammatory, and anti-oxidizing agent. Ashwagandha naturally helps to increase cytotoxic T- lymphocyte production. Guduchi: - Its plant extract is used for many types of cancer. Being an immunomodulator, it helps to regulate immune system to check cancer cells. Draksha: - This herb stops pancreatic and colorectal cancer cells from spreading and migrating without harming healthy cells. The grape seed extract actually gets accumulated in large amounts in the colon, as they are not well absorbed in the stomach and start building up in colon. Thus, it can inhibit the creation of new blood vessels and naturally arrests the growth of colon tumors. Rason: - Rason contains a natural compound that has immune-strengthening and anti-carcinogenic qualities. It has the ability to prevent the formation of cancer-causing substance, and reduces the cell proliferation. Eat anti-oxidant rich food/fruits (apple, strawberries blueberries, plum, pomegranates, avocados, green leafy vegetables, and cruciferous vegetables) in your diet to reduce free radicals concentration. Eat vitamin C rich foods along with whole grains, cereals and pulses. Consume probiotic (yogurt or whey water) & prebiotic (raw onion, garlic, wheat bran) food items. Wash all fruits and vegetables with warm water to destroy contaminations. Supta Baddha Konasana (Reclining Butterfly pose)- It relieves the tension of shoulder, chest muscles, & stimulates abdominal organs. This Yoga Asana ensures a naturally relaxed state of abdominal muscles. It is effective especially for breast cancer patients as the muscles become weak and tight around these particular areas. Viparita Karani (Legs up the wall pose)- It is a restorative posture that allows mind and body to relax, and facilitates venous drainage and increases circulation. It relieves lower back tension and causes pelvic floor relaxation. It stretches hamstring and lowers back. It soothes swollen or cramped feet and legs. It creates more balance, clear thinking, & enhances brain function. Strengthens digestive and nervous system. Lymphatic bandages can be used to assist the drainage of excess fluid. Manual lymph drainage techniques i.e. effleurage helps in effective management and increases blood circulation. ROM (Range of Motion) exercises to increase the efficiency of drainage. Aerobic exercises are also useful. Walking and cardiovascular training can be performed but under proper monitoring and guidance. 3. Cancer-related fatigue (CRF)- Functional training including ADL's (Activities of Daily Living) helps to reduce fatigue and increases the efficiency of performing day to day tasks. Massage- Helps in removal of toxins responsible for causing pain with the increase in blood flow. Modalities- TENS, IFT has no side effects and works on the pain gate mechanism to inhibit pain. Stretching exercises- Realigns disorganized muscle and brings about relief from pain and spasm. 5. Peripheral neuropathy (balancing exercises) - It is helpful in proprioception. 6. Genitourinary complications (Kegel's exercises) - Helps in toning and strengthening of pelvic floor muscles.